Used on backgrinding machines for thinning and flattening silicon wafers, glass products, ceramic products. Sizes range from 8” to 14” O.D. Used on machines manufactured by Disco, Okamoto, Strasbaugh, and many others. Available in large variety of bond such as sintered (metal bond), resin bond, vitrified bond, plated (nickel bond). 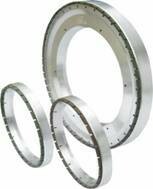 Specification of diamond backgrinding wheel can be optimized to fit your particular application/material. Semiconductor wafers are routinely thinned prior to dicing to aid the sawing operation and to allow the final assembled package thickness to be minimized. For semiconductor devices required to operate at high power levels, wafer thinning improves the ability to dissipate heat by lowering the thermal resistance of die. As final thickness is decreased, the wafer progressively becomes less able to support its own weight and to resist the stresses generated by post backgrinding processes. Thus, it is important to reduce the damage caused by backgrinding. UKAM Industrial Superhard Tools has the technology and expertise to help you optimize your backgrinding process to ultimate level of efficiency.